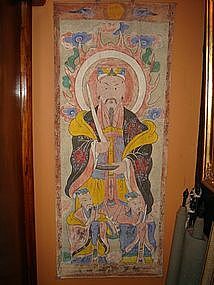 A beautiful Yao Mien Ceremonial Painting of Daoist God on original Mulberry Paper. Good condition overall, some signs of age due to climatic conditions. Size 47" x 19". Unframed. A beautiful and well preserved Thai "Bible" illustrated with 4 paintings (2 on each side) from the JATAKA TALES with Sanskrit-Pali scripture and a Thai dedication from the person who made merit with this holy manuscript. 18th/19th Century, unframed. Size: L. 27" x H. 17" ( 69 cm. x 43 cm.). RARE! 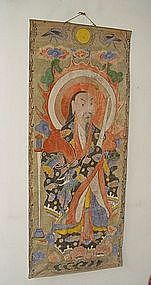 Antique, iconographically important Yao Ceremonial Daoist God Scroll-Painting, 19th Century, Southern China. Good condition, some signs of age/climatic conditions. 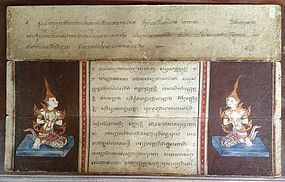 Size: H. 47" x W. 19"
Rare Thai Classical Painting of the Legend "Maktri & Prince Kahtah". Nice rendering of Siamese architecture with dormant lions in the forest. This is an original painting, not a print or reproduction. Condition: good, size unframed W. 50cm x H. 60cm. This painting is framed with glass. 19th Century. 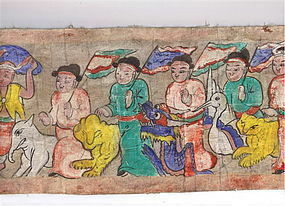 Antique Yao Ceremonial God Scroll-Painting, 19th Century, Southern China, good condition, iconographically important in Daoist art. Size: H. 47" x W. 19"